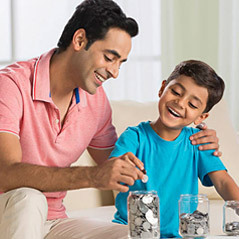 Irrespective of whether your needs are short term or for longer periods, Bank of Baroda enables you to maximise your savings and can offer good return on investment through its Deposit plans. Fixed deposits are categorised into deposits with a term period of less than 12 months, more than 12 months and recurring deposits. These deposit plans offer convenient solutions to both working individuals as well as senior citizens. A basic saving plan, which helps you regulate your savings and reap its benefits from time to time. Also avail up to 95% of the deposit amount by way of loan/overdraft..